Prof Frank Howard ran away at an early age and came back from being at sea literally covered in tattoos. Here is an old cabinet card from Barnum’s circus where he traveled for many years. 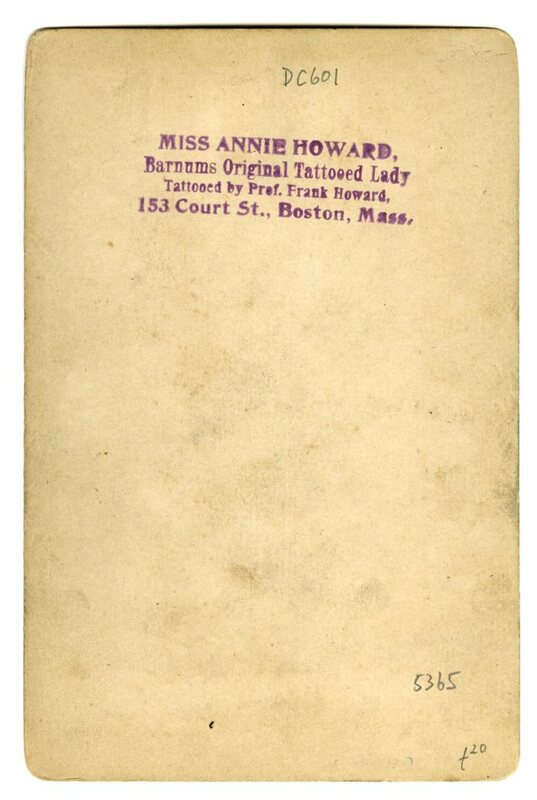 “Annie Howard was a tattooed lady who exhibited with her husband, Frank Howard, in Barnum and Bailey's show in the early 1900s. They told the usual story of being captured by "savages" who forcibly tattooed them. In reality, many of Annie Howard's tattoos were done by her husband. Frank and Annie had a daughter together named Ivy, who became a snake charmer when she was 8. In 1987, the family moved to London with Barnum and Bailey's show. Annie Howard became notorious in 1882 for being arrested on her way to an interview with Bunnell's Museum for assaulting a man who had insulted her for having tattoos. Bunnell was very happy with the publicity and hired her when she was released after spending 10 days in jail.